Ride the waves with Ariel and Flounder as she explores new worlds in her dolphin carriage! 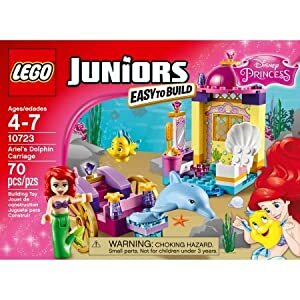 Prepare Ariel for her day and ride along with her and Flounder in her dolphin carriage, including underwater castle, mini-doll: Ariel, Flounder, dolphin and accessories. Enter the magical world of LEGO® Juniors | Disney Princess™ with Ariel's dolphin-drawn carriage, plus underwater castle with a chair, mirror, shell seat and drawer that opens and closes, and plenty of accessories. 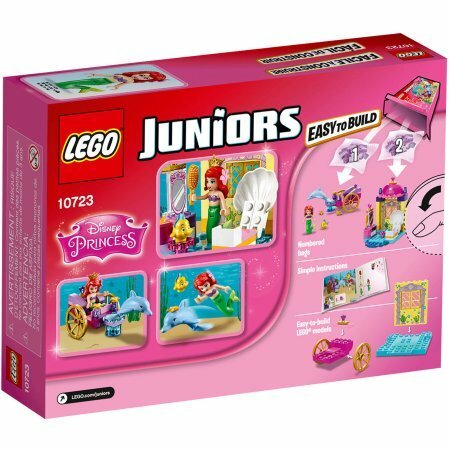 LEGO Juniors is an age-appropriate building experience for ages 4-7, with easy-to assemble models that feature Disney's beloved classic story of Ariel. Includes mini-doll: Ariel, her best friend Flounder and dolphin.